A.J. Green scored three touchdowns in the first 17 minutes as the Cincinnati Bengals hung on for a 34-23 victory over the visiting Baltimore Ravens on Thursday night to take an early AFC North lead. After trailing 21-0, Baltimore fought back to trail 28-23 in the fourth quarter. However, Cincinnati added a field goal before safety Shawn Williams strip-sacked Ravens quarterback Joe Flacco, and Jordan Willis recovered with 2:42 left to all but seal the game. Bengals kicker Randy Bullock added one more field goal for the final margin. With top Ravens cornerback Jimmy Smith serving a four-game suspension, Green totalled five catches for 69 yards, notching all three TDs from the slot. He now has 44 grabs for 764 yards and nine scores in his past eight games against Baltimore. Cincinnati quarterback Andy Dalton finished 24 of 42 for 265 yards and four touchdowns, which came on four consecutive drives in the first half. Running back Joe Mixon battled a right knee issue but finished with 87 yards on 22 touches, and Tyler Boyd added six catches for 91 yards and a score. Cincinnati (2-0) has now won eight of their last 10 meetings with Baltimore (1-1), including six of seven at home. 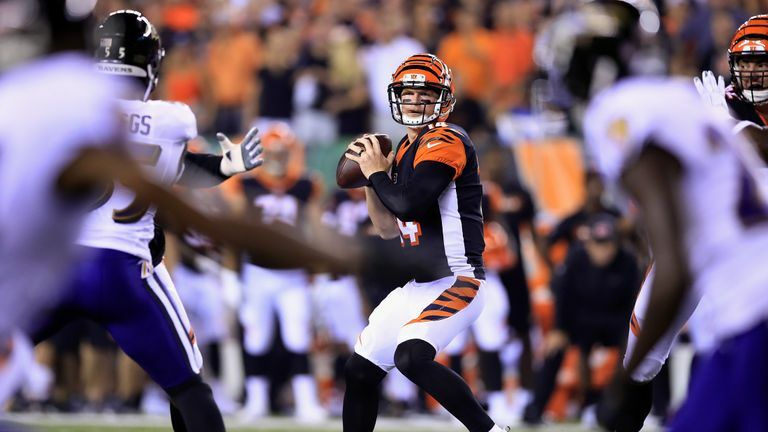 Geno Atkins (two sacks, four QB hits) repeatedly hounded Flacco, who completed 32 of 55 passes for 376 yards, with two touchdowns and two interceptions while struggling with his accuracy. An early interception by Cincinnati rookie safety Jessie Bates set up Green, who beat Tavon Young for a four-yard touchdown at 10:35 of the first quarter. Six minutes later, Green caught a slant, broke Young's tackle and scampered 32 yards past Eric Weddle to make it 14-0. After a Terrell Suggs penalty on third-and-13 kept the Bengals' next possession alive, Green beat Marlon Humphrey from seven yards out at 13:02 of the second period. The Ravens sandwiched one-yard scores by Buck Allen (rushing) and rookie Mark Andrews (receiving) around Boyd's 14-yard touchdown to get within 28-14 at half-time. After a Justin Tucker 55-yard field goal in the third quarter, Ravens receiver John Brown made it 28-23 with 9:35 to play in the fourth on a gorgeous 21-yard contested grab. The ensuing two-point conversion failed, leaving Baltimore down by five. Bullock made a 28-yard field goal with 2:59 left after Cincinnati drained 6:36 off the clock, increasing the lead to 31-23. Ravens linebacker C.J. Mosley was carted to the locker room early in the first quarter with a bone bruise in his left knee. He did not return. Bengals defensive end Michael Johnson (left knee) and rookie first-round center Billy Price (right ankle) left in the first quarter and did not return. Cornerback Dre Kirkpatrick and Williams each limped off the field in the closing minutes.